Hello friends, here's another Blue Moon post! I just found another interesting video over the net and I thought of sharing this to each and everyone. The video itself is uploaded on NewGrounds.com. The story is actually a series about a battle between an animator and his animation. Have you imagined what will happen if your animation has gain a mind of its own? now you'll know by watching this 3-part series animation. Not only that the animation is moving on it's own.. even the other desktop icons fight to save the whole computer for the sake of the animator! Video Requirement: You need to have a flash player plugin on your browser to watch the series. 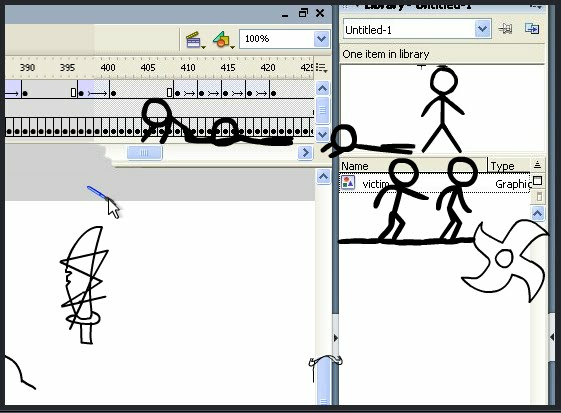 The first of the series shows how the animator creates the first stick figure victim. Now, is he really the victim? He has returned after escaping the slavery! and now there's more.. the lord of darkness! Looks good to see! Imagine! Your own created animation can think by their own.